Please note: the dating of clocks by labels alone can sometimes be misleading. Using the chart below, the only thing you can tell for sure (if the label is genuine and original to the clock) is that the clock was not made BEFORE the change in labeling. 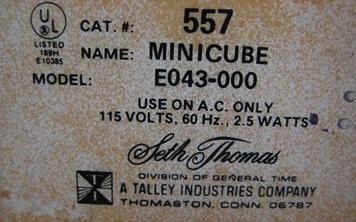 However, manufacturers often continued to use old stock of labels until they were used up. 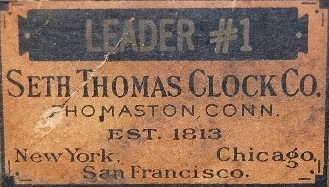 This means, for instance, even after the name of the town was changed from Plymouth to Thomaston you can still find Plymouth labels applied to clocks made after 1866. Seth Thomas (only) or Seth Thomas along with Eli Terry's name, no town listed. Seth Thomas, Div of General Time Instrument Corp.
Seth Thomas, Division General Time Corp.